You can explore on your own, but if you join up with a social dog walking group, you and your pooch can make new friends as you see the sights. With the right group, your pup can get in some unfettered playtime fun, too. 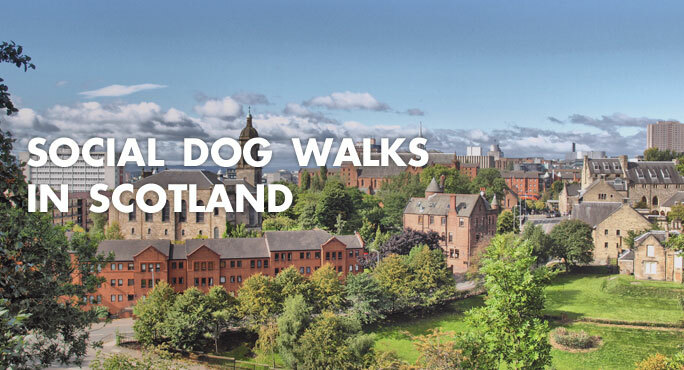 Dogs are so popular in Scotland, you can find groups to walk with virtually anywhere. If you own any type of dog and enjoy hiking, climbing, skiing, riding and/or paddling with your furry friend, you’ll want to meet these folks. They are always ready for new outdoor adventures. Aptly named, this group focuses on “walks which are not too difficult, and are conducted at a reasonable pace.” It’s all about the social interaction, with like-minded dog owners who want to get some exercise and fresh air. This group makes it easy to fit an event into your schedule. They “walk our lovely dogs in various locations ranging from city centre park walks to off lead rural walks at different times and days of the week.” Convenient, ay, but it gets even better. “After the walks, pending on availability, there is a chance for more chat and socialisation in a dog friendly pub/café for some coffee, tea and/or food.” Or maybe a wee dram. A very warm welcome to all our new members! Hope you're all ready for a busy year ahead in the great Scottish outdoors. This is a child and dog friendly club (on suitable walks/climbs). Dogs must be kept under control by owners and kept on leash where applicable. The Aberdonian Dogs Owners Club was created two years ago to gather people and pooches of all sizes and descriptions for group canine walking events. It’s been a rousing success, for owners who want to meet new friends and dogs that want a good romp. As one person commented, “It stimulates them. They say 10 minutes playing with other dogs is better than two hours walking.” We don’t know who “they” are, but we know every dog owner recognizes the truth in that statement. Looking for a Specific Breed Group? Westies Aberdeen, a meet-up group for fans and owners of Scotland’s famous West Highland White Terriers in Aberdeen and Aberdeenshire. Well-known dog trainer Cesar Milan says it’s easy to start a dog walking club – in your town or even just in your neighborhood. He suggests you first decide the goals for your group – breed(s) of dogs you want to include, whether the purpose is primarily social or you want to include dog training at events, etc. Then start seeking out prospective members by talking up dog owners you know, putting up posters or posting online, and getting referrals from dog rescue groups, your vet, and local pet stores. Wherever you are in Scotland, outside urban areas, it is essential to keep in mind that farm animals and working dogs are the norm, in addition to wildlife. For everyone’s safety, you must learn and observe the Scottish Outdoor Access Code so you and your dog can be good social neighbors. What if the weather is less than inviting? Given its geographic location, Scotland is prone to rain and even snow in winter. You can bundle up and don your galoshes (and perhaps outfit your pooch in a stylish hooded raincoat and booties as well). But sometimes a soggy day simply does not beckon. Not to worry, as they say in Scotland. There are plenty of things you can do to help your pup get exercise anywhere, including indoors.